Free Hugs-Italian Style-Abbracci gratis" and "UN-DON-DON"
Please watch this video - it starts out a tad slow - but then........! and now about "UN - DON - DON" Say it aloud - for I have spelled it phonetically - it is a type of Italian slang, a phrase if you will, most likely specific to only my Mom's Italian heritage and tradition. I say it often. Let me explain - Saturday evening I stayed with my Mom since my sister was away. Also, my daughter and grandson joined us. My Mom cannot have any type of tomatoes even in a sauce. I made her one of her favorite meals - sauteed peppers and eggs on Italian bread while we ordered pizza. She also had a salad with a light balsamic vinaigrette dressing. It is so wonderful to see her appetite improve as some of the medicines and adjustments improve her overall strength while she is waiting for dialysis to be able to start. I hope you all always have the desire to do "UN-DON-DON"!! I am so aware of the life's lessons my Mom is so humbly naturally, and faithfully teaching us by loving example. I was with her the other day - as is often the case. We sat at her little dining room table, of honey wood and white ceramic tiles. We had shared a simple meal I had prepared and brought to her. She was ever so gracious and appreciative. We could have been eating "S___ On A Shingle" and we would have been delighted. Anyway, she spoke more in detail about Derrick who shared with my Mom that he wants to be a Physician's Assistant and is going back to school. My Mom said she applauded his goals and told him that he is so wonderful with people and that he will make a great physician's assistant. She went on to say that she complimented, often, all of the staff who provided her with respectful and competent care. She also reminded me that she let folks know when they were out of line or missed the mark!. Each, she said, are of equal merit. And so she went on to say, I still have to spread the good news". And I said, "Mom, what good news is that?" And she said, "The good news about God and his plan for all of us, like Derrick to become a physicians assistant!!!" Perhaps we all can learn from my Mom's faith and her sharing "The Good News". And I will ask you as I am asking myself - where and how am I spreading "The Good News"? I am so aware of the lessons our Mom is teaching us as she faces this health challenge with such courage, dignity, clarity and unyielding faith. I am humbled in her frail shadow. We all sat around her hospital bed two days ago. She had just come through an episode that I can only tell you that in its frightening intensity was like watching someone drown. The wonders of modern medicine fixed the problem and Mom was obviously so relieved and calm again with a sparkle in her beautiful blue eyes and a soft smile on her beautiful face. When we heard what she wrote we were in awe of her faith and strength and hopes amidst all the tubes and procedures and being poked and prodded. You could have heard a pin drop - as we absorbed her immense faith and strength. Hallelujah!! It is no secret really as to why my Mom has such faith - and this song below is so fitting. P.S. Mom is in surgery as I write this post. God be with her. Praying for all good outcomes. I was inspired to write about the necklace pictured below. It really does look like one of those swirled colored lollipops, doesn't it? 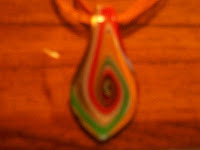 It is a glass type stone and the chain is orange ribbons and orange string. It is a fun, summer time accent piece. It was a gift a year ago this August from my dear friend Dale, who is from "down-under" and a wonderful 'mate' - and dear, trusted friend. I wore such fun colors to go and visit my Mom - to brighten her day. it worked. I too needed brightening. My last post spoke of my new grandson,n "Damian Chance" - and my struggle with 'my place' in his life - in my daughter's life - and I was broken hearted - and I still am. The reality is harsh and unwelcome. Her life and all of it's unsettling details are complicated, desperate, and heart wrenching in their intent for her and her children. And now this little guy, born unto, into - chaos, and rift, confusion and anger - and so I remain calm, loving from afar. "God, is this how you bring her to me, is this how? You give this innocent child a bad heart so she will need me?, NO NO NO!!!" I scream in silence. I cry out loud. Time passed and she spoke, telling me that one of his heart valves is enlarged and they have called in a pediatric cardiologist specialist from Buffalo Children's Hospital. I tell her I love her and that I will pray and to call me when she knows what is next. As planned, I went to my Mom's wearing the bright orange shirt and the bright stone/glass colored lollipop necklace. I don't want to burden her - I hold it all in. Later, I call my daughter - and he answers, the baby's father. I was paralyzed for a moment. I ask for my daughter. She explains that he will be seen on the outside and monitored weekly for a year to see if his little body is growing in to his enlarged valve. He will require special care and medicines....until it is determined if he needs heart valve surgery or not. I was relieved and also filled with fear and restless projections. Her/their/his life is all so complicated. I still don't know where I fit in - if at all. I know that my love cannot be stopped - nor my prayers rejected. Both are mine to give and so I will. I hope to meet him one day - and hold him and sing to him and cradle him in my arms. If only in my dreams. Meanwhile I will wear that lollipop stone/glass brightly swirled-colored necklace to cheer me - everyone who sees it comments in the happiest of ways. And now, I have another reason to wear it. My Mom took a turn for the worse - she is headed to Yale Hospital - via ambulance. I will wear the brightly swirled/colored glass/stone lollipop necklace to go be with her. Everyone who sees it comments in the happiest of ways. Baby and Mom are both doing well!- "thank you God". I was explaining to my husband that I wished I could say that it was intentional - that there is some strong emotion over whatever that made her choose not to call. At least if that were true we could work on the "whatever". I don't believe that is the case. I have become an after thought, my purpose in her life has become one of indifference - over time - I lost my place and this birth crystallized how much that reality hurts. Like I said - I can't stop crying. And so I hope and I wish and I love from afar - I send gifts and flowers and I call - I keep it open and alive - on this side of nowhere. And this song continues to speak for me - sing my heart - and still - I can't stop crying. We are all so eager to spew about faith when life is simple - no crisis - our belief and faith is solid. We are certain it is a faith upon which we can rely - no matter what. And then, something happens, and we find ourselves tilting our head to the side in wonder, question, uncertainty, doubt and anger. And I ask........Where is my faith now? How is it that this amazing and loyal servant of His, my Mom - who has followed Him all her life, believed in Him and did all things in His name - has betrayed her now - having her suffer and be afraid. "NO - NO - NO"!!! I realized that God has been part of a greater plan forever. I began to trace back the events that led to now. I was stunned, knocked over stunned with the truth of it all. I could even trace it back to choices my Mom and Dad made and that their parents made all in preparation for now. It is so perfectly mind boggling and certain - it is faith told - it is faith known - it is love eternal. and then I had Dolan - and I returned to school for a higher degree. I began to deal with my childhood abuses from the teacher which led me to the Catholic church. It is there I met Kathy. She was one of my clients as part of the Pastoral Counseling Center. I really appreciated her and her journey and all her gifts and talents. After I left the church we lost touch. Some 15 year's later I received a phone call from two doctors that lived in Guilford. Kathy had been the nanny to their neighbor's son who was good friends with one of their sons. They were in search of a Drug And Alcohol Counselor - Kathy gave them my name. And so we began to meet and have done so for over two years. And so my temporary loss of faith, my doubt and uncertainty, my wonder and question and even my tilted head has straightened out. I know that God loves my Mom so much that He had a plan for generations so that when she needed the BEST kidney team in the country she would be positioned by events to have just that!!!!!! I fall to my knees in humble gratitude at the immense power of this revelation. It is so huge I can barely carry it - and I mean that in the best of ways. And so we are in the storm - and so we are not alone. Amen.